TORONTO, ON – September 26, 2018 – The Toyota Tundra has proven – time and again – that it’s up to the task. 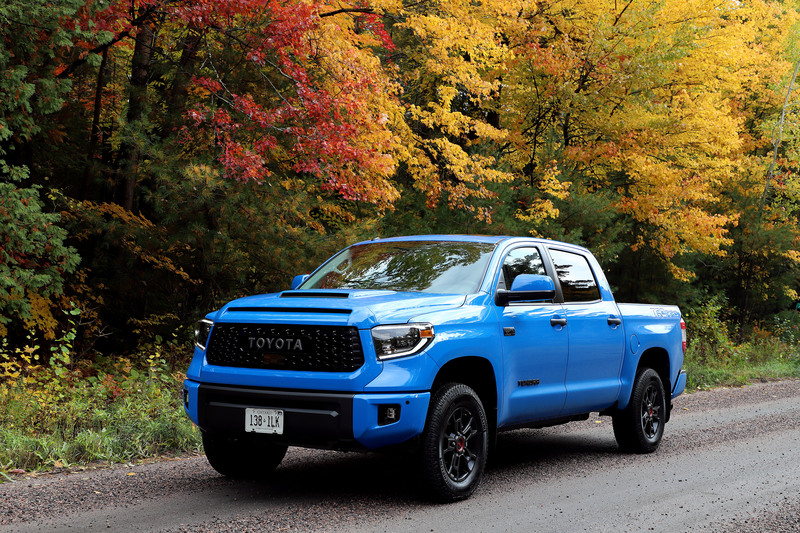 And for 2019, Toyota offers its full-size pick-up truck in a range of models and trim levels, highlighted by an enhanced pair of Toyota Tundra TRD Pro models that are more capable than ever. So, what are you waiting for? A great pick-up truck starts with a great heart – and the heart of the Tundra is a powerful, responsive and efficient powertrain. Most Tundra models are built around Toyota’s proven 5.7 litre i-FORCE V8 engine, delivering up to 381 horsepower and 401 lb-ft of torque, and paired to a six-speed automatic transmission with sequential shift mode operation. All models with the 5.7L engine are also standard equipped with a 144L fuel tank, lock-up torque converter, trailer brake controller, and Toyota’s Tow Package. 4x4 models feature a one-touch 4WD mode with auto limited slip rear differential, active traction control, and trailer sway control. Tundra’s rugged style gives it immediate curb appeal, with a bold and chiselled body. Standard exterior features of note include LED daytime running lights and power adjustable and heated folding exterior mirrors. Inside, the Tundra cabin is spacious and features many standard amenities to make Tundra a comfortable place to spend long days on the job or on the road. These include a Display Audio system with touchscreen, USB audio input and steering wheel-mounted controls, Bluetooth® connectivity, air conditioning, power locks and windows, a 4.2” multi-information display, and more. Safety is also a full-size feature in the Toyota Tundra. Every model is outfitted with Toyota Safety Sense P – an industry-leading bundle of active safety technologies included as standard equipment on 95 percent of all new vehicles Toyota sells in Canada. TSS P features the Pre-Collision System with Pedestrian Detection, Lane Departure Alert with Steering Assist, Automatic High Beams, and Dynamic Radar Cruise Control. These work together to enhance driver capabilities to mitigate collisions, stay in lane, and see at night. Other safety systems include the Toyota Star Safety System, eight airbags, a back-up camera, and a direct tire pressure monitoring system. When towing and carrying capability is top of the list, the 2019 Toyota Tundra 4x2 Double Cab SR5 Plus 5.7L (Starting MSRP: $39,625) features room for up to six people, an 8.1-foot cargo bed with a 1,709 lb (775 kg) payload, 5.7L i-FORCE V8, and a 10,000 lb (4,535 kg) towing capacity.. The 2019 Toyota Tundra 4x4 Double Cab SR 4.6L (Starting MSRP: $39,990) offers even better fuel efficiency thanks to its 4.6L i-FORCE V8. This engine generates 310 peak horsepower and up to 327 lb-ft of torque – making it remarkably capable even as it reduces city/highway combined fuel consumption by more than one litre per 100 km (14.9L / 100 km for the 4.6L engine, versus 16.2L / 100 km for the 5.7L engine). This model features room for up to six people, a 6.5-foot cargo bed with a 1,500 lb (680 kg) payload, and a 6,500 lb (2,948 kg) towing capacity. Additional standard gear includes 6.1” Display Audio, 60/40 fold-up rear seats, a 40/20/40 front bench seat, three 12V DC power outlets for portable electronics, and more. Styling cues include 18” styled steel wheels, black outside mirrors, rear bumper and grille surround, and black dash trim and inside door handles. This model may be enhanced with the SR5 Plus Package (Starting MSRP: $44,100), which adds comfort, convenience, style and versatility upgrades. The audio system is enhanced with a 7” display, integrated XM Satellite Radio, and advanced voice recognition. Versatility upgrades include a rear bench seat with under-seat storage, a bed-rail system and set of four tie-down cleats and a front centre console box. Convenience and comfort is improved from already impressive levels with power windows, a sliding rear window, keyless entry, cruise control, illuminated vanity mirrors, variable intermittent wipers, foot well lighting, telescoping steering column, heated front bucket seats, and an eight-way power adjustable driver’s seat. Style enhancements include chrome bumper ends and grille surround, unique 18” alloy wheels, silver dash trim, fog lamps, rear privacy glass, and more. The 2019 Toyota Tundra 4x4 Double Cab SR5 Plus 5.7L (Starting MSRP: $45,005) features room for up to five people, a 6.5-foot cargo bed with a 1,633 lb (740 kg) payload, 5.7L i-FORCE V8, and a 9,700 lb (4,400 kg) towing capacity. This model, priced at $1,385 less than the 2018 model, includes a towing package, bed-rail system and four tie-down cleats, plus the convenience of keyless entry. In-cabin storage includes a rear bench with under-seat storage and front centre console box. Comfort and convenience features include a 7” Display Audio system with integrated Sirius XM satellite radio, eight-way power adjustable driver’s seat, heated front seats, a tilting & telescoping steering column, three 12V DC power outlets for portable electronics, illuminated vanity mirrors, foot well lighting and variable intermittent wipers. Styling cues include silver dash trim, chrome vent trim, 18” alloy wheels, rear privacy glass, chrome grill surround, black steel rear step bumper and fog lamps. The SX Package (Starting MSRP: $45,090) is new for 2019. It adds unique glossy black 18” alloy wheels, a black grille, and more. The TRD Offroad Package (Starting MSRP: $47,620) adds impressive offroad capability with fuel tank protector plates, Bilstein shock absorbers, 18” offroad alloy wheels with all-terrain tires, clearance and back-up sensors, a navigation system, and an auto-dimming rear view mirror with integrated compass, for $2,270 less than the 2018 model Style, comfort and convenience upgrades include a power moon roof, LED headlamps and fog lamps, an integrated garage door opener and an anti-theft system. The TRD Sport Package (Starting MSRP: $49,125) boosts performance with a sport-tuned suspension system, sport-tuned Bilstein shock absorbers, TRD front and rear sway bars and unique 20” alloy wheels. Other features include a navigation package, clearance and back-up sensors, an integrated garage door opener, auto-dimming rear view mirror with compass, anti-theft system, LED headlamps and fog lamps, a power moon roof, TRD shift knob, a hood scoop, and more, for $2,265 less than the 2018 model. The TRD PRO (Starting MSRP: $61,530) is substantially updated for 2019, with new 18” forged alloy wheels plus 2.5” FOX internal bypass shocks. Other updates include Rigid Industries fog lamps, a hood scoop, new “TOYOTA” heritage grille design, TRD performance dual exhaust with black chrome tip, TRD shift knob and unique TRD PRO carpet mats. The TRD PRO builds on the TRD Offroad Package, adding a remote reservoir suspension, premium audio system with AVN Premium Navigation, black leather seating with red stitching, TRD skid plate, a spray-in bedliner, the blind spot monitor, and more. The 2019 Toyota Tundra 4x4 Double Cab SR5 Plus Long Bed 5.7L (Starting MSRP: $46,600) features room for up to five people, an 8.1-foot cargo bed with a 1,601 lb (726 kg) payload, 5.7L i-FORCE V8, and a 9,400 lb (4,264 kg) towing capacity. It is otherwise equipped similarly to the 2019 Toyota Tundra 4x4 Double Cab SR5 Plus 5.7L. The 2019 Toyota Tundra 4x4 Double Cab Limited 5.7L (Starting MSRP: $56,180) features room for up to five people, a 6.5-foot cargo bed with a 1,589 lb (720 kg) payload, 5.7L i-FORCE V8, and a 9,100 lb (4,128 kg) towing capacity. The Limited model includes a towing package, spray-in bed liner, bed rail system and four tie-down cleats and is loaded with premium features, such as a 7” Display Audio system with integrated Sirius XM satellite radio and AVN Premium Navigation, dual-zone automatic climate control, leather-wrapped steering wheel, eight-way power adjustable driver’s seat and four-way power-adjustable front passenger’s seat, leather seat surfaces, auto-dimming rear view mirror, power sliding rear window, soft dash and door trim, wood-grain accents, and silver inside door handles. Other features include a compass, privacy glass, four 12V DC power outlets for portable electronics, an integrated garage door opener and keyless entry. Safety enhancements include clearance and back-up sensors and the Blind Spot Monitor System and Rear Cross Traffic Alert, the automatic headlamp system, plus an anti-theft system with glass break sensor. Styling cues include unique 20” alloy wheels, chrome finishes on exterior mirrors, front bumper ends and exterior door handles, LED headlamps and LED fog lamps. The 2019 Toyota Tundra 4x4 CrewMax SR5 Plus 5.7L (Starting MSRP: $46,000, which is $1,990 less than the 2018 model) features room for up to five people, a 5.5-foot cargo bed with a 1,568 lb (711 kg) payload, 5.7L i-FORCE V8, and a 9,200 lb (4,173 kg) towing capacity. This model includes a towing package, bed-rail system and four tie-down cleats. Other features include a 7” Display Audio system with integrated Sirius XM satellite radio, 60/40 split fold-up rear seats with fold-down centre armrest, eight-way power adjustable driver’s seat, heated front seats, power vertical sliding rear window, privacy glass, silver inside door handles and dash trim, soft door trim, tilting/telescoping steering column, three 12V DC power outlets for portable electronics, keyless entry, 18” alloy wheels, chrome front and rear bumper ends, black exterior door handles, and fog lamps. The TRD Offroad Package (Starting MSRP: $49,120) adds impressive offroad capability with fuel tank protector plates, Bilstein shock absorbers, 18” offroad alloy wheels with all-terrain tires, clearance and back-up sensors, a navigation system, and an auto-dimming rear view mirror with integrated compass. Style, comfort and convenience upgrades include a power moon roof, LED headlamps and fog lamps, an integrated garage door opener and an anti-theft system, for $3,270 less than the 2018 model. The TRD Sport Package (Starting MSRP: $50,590) boosts performance with a sport-tuned suspension system, sport-tuned Bilstein shock absorbers, TRD front and rear sway bars and unique 20” alloy wheels, despite being $3,300 less expensive than the 2018 model. Other features include a navigation package, clearance and back-up sensors, an integrated garage door opener, auto-dimming rear view mirror with compass, anti-theft system, LED headlamps and fog lamps, a power moon roof, TRD shift knob, a hood scoop, and more. The TRD PRO (Starting MSRP: $63,900) is substantially updated for 2019, with new 18” forged alloy wheels plus 2.5” FOX internal bypass shocks. Other updates include Rigid Industries fog lamps, a hood scoop, new “TOYOTA” heritage grille design, TRD performance dual exhaust with black chrome tip, TRD shift knob and unique TRD PRO carpet mats. The TRD PRO builds on the TRD Offroad Package, adding a remote reservoir suspension, premium audio system with AVN Premium Navigation, black leather seating with red stitching, TRD skid plate, a spray-in bedliner, the blind spot monitor, and more. The 2019 Toyota Tundra 4x4 CrewMax Limited 5.7L (Starting MSRP: $58,080) features room for up to five people, a 5.5-foot cargo bed with a 1,535 lb (696 kg) payload, 5.7L i-FORCE V8, and a 8,900 lb (4,037 kg) towing capacity. The Limited model includes a towing package, spray-in bed liner, bed rail system and four tie-down cleats and is similarly equipped to the 2019 Toyota Tundra 4x4 Double Cab Limited 5.7L, but with CrewMax cab features such as the 60/40 split fold-up rear seats with fold-down centre armrest and power vertical sliding rear window. The 2019 Toyota Tundra 4x4 CrewMax Platinum 5.7L (Starting MSRP: $61,210) features room for up to five people, a 5.5-foot cargo bed with a 1,535 lb (696 kg) payload, 5.7L i-FORCE V8, and a 8,800 lb (3,992 kg) towing capacity. New for this year, this model is now standard equipped with a power tailgate lock. The Platinum grade sports many premium features, such as a 12-speaker JBL Audio system with 7” display and integrated Sirius XM satellite radio, AVN Premium Navigation, dual-zone automatic climate control, 60/40 split fold-up rear seats with fold-down centre armrest, 10-way power adjustable driver’s seat with memory system, four-way power adjustable front passenger’s seat, heated and ventilated front seats, premium leather seat material, a leather-wrapped steering wheel on a tilting/telescoping steering column linked to the driver’s seat memory system, power retractable and folding memory system-linked exterior mirrors with integrated signal lamps and puddle lamps, auto-dimming rear view mirror, a compass, power windows with driver and front passenger auto up/down function and a power vertical sliding rear window. Styling features in the cabin include chrome inside door handles, vent knobs and interior trim, leather dash trim, and soft door trim and dash trim. Other features include privacy glass, four 12V DC power outlets for portable electronics, keyless entry, and an integrated garage door opener. Safety enhancements include clearance and back-up sensors and the Blind Spot Monitor System and Rear Cross Traffic Alert, the automatic headlamp system, plus an anti-theft system with glass break sensor. Exterior styling cues include unique 20” premium alloy wheels, a power tilting/sliding moon roof, a billet-style front grille, chrome exterior door handles, LED headlamps and LED fog lamps. This model may also be ordered as the 1794 Edition (Starting MSRP: $61,715), which features a woodgrain and leather-wrapped steering wheel and shift knob, premium brown leather seating with suede accents, chrome accents (including front bumper ends, grille surround) bright silver bumper centre, unique 1794 Edition badging, a power tailgate lock, and an available exclusive body colour: Smoked Mesquite. The 2019 Toyota Tundra is on sale at Toyota Dealers across Canada. For complete and up to date details and specifications, visit www.toyota.ca/tundra.